Photo by Jenny Kirk Fellow students (in the foreground) Melissa Downing and Asa Nelson ask questions of presenters Leah Stevens (not pictured), Deena Weber and Tyler Molitor during the 13 annual Undergraduate Research Conference on Wednesday throughout the campus at Southwest Minnesota State University. 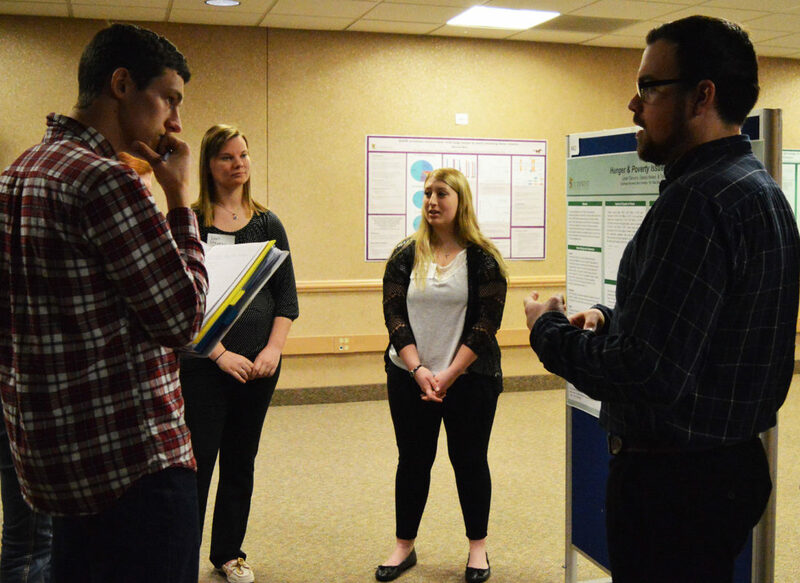 MARSHALL — The intellectual achievements of students representing 17 different program areas were showcased at the 13th annual Undergraduate Research Conference on Wednesday at Southwest Minnesota State University. Agribusiness students Leah Stevens, Deena Weber and Tyler Molitor researched and presented hunger and poverty issues in Yemen, one of the oldest areas of human civilization in the Middle East. Stevens said the average annual income is $2,200. The students said Yemen’s exports are really limited because of its climate. Molitor said people in Yemen are in a rough spot. The trio found that 75 percent of men and 25 percent of women in Yemen chew qat all day, every day. Molitor said he focuses most of his research on the imports, exports and agriculture. Weber pointed to a graph on the poster board that showed an enormous decrease. “Here’s 2016 and the major part, the actual civil war part of it started in 2015, so there’s this dramatic drop right there,” she said. Molitor added that part of the issue has to do with the commodity prices dropping. Drilling deeper wells in search of fresh water is one of the solutions the group came up with. Molitor said one positive is that the fishery sector is growing in Yemen. A high population growth rate complicates the situation. Like a lot of other developing countries, Yemen traditionally had high birth rates as well as high death rates. Molitor, Weber and Stevens said what is happening in Yemen is a tragedy. Among the 29 different faculty advisers involved is environmental science professor Dr. Emily Deaver, who got the Undergrad Conference going. She said it is gratifying to see its growth. At the first conference in 2006, there were only science students in environmental science, biology, physics and chemistry involved. Deaver said the research process includes a different kind of learning for students than in the classroom setting. As a result, Deaver said it takes “really dedicated faculty” who go above and beyond their normal teaching load. While the level of projects varies, disciplines like political science and sociology use the conference as a capstone. Hundreds of other SMSU students also take part in the conference through various class requirements. Deaver asks her intro to environmental science students to pick three or four presentations and write up a paper detailing what they saw and learned. With a diverse group of students, it’s not surprising that the topics varied a great deal. Philosophy student Kelly Regan probed ethics regarding euthanasia in society and found that six U.S. states have legalized euthanasia or physician-assisted suicide. History student Colin Hoppe researched the largest mass execution in human history, noting that while the U.S.-Dakota Conflict of 1862 lasted only five months, but left a long-lasting scar not only on Minnesota, but also on the nation. Environmental science student Hunter Czycalla explored lichen populations on different types of granitic rocks in the Minnesota River Valley, while philosophy student Jessica Stai pondered veganism and whether or not people should join the bandwagon. Biology student Gus Molina found that the central complement protein C3 is unknown, but that it’s discovery may improve treatments. Molina said Alzheimer’s is characterized by the formation of amyloid plaques — proteins in the brain — and neurofibrillary tangles. Molina said he spent the entire semester scrutinizing information.